July has been a busy month with events and traveling. It kicked off with the Deerfield River Fest in MA. I set up a booth for Wave Sport right next to the NRS booth which was run by Blake. We had lots of visitors just chilling out in our booths and Kenny brought cake so it was a good night! Confluence Outdoors donated a couple boats for the Silent Auction. 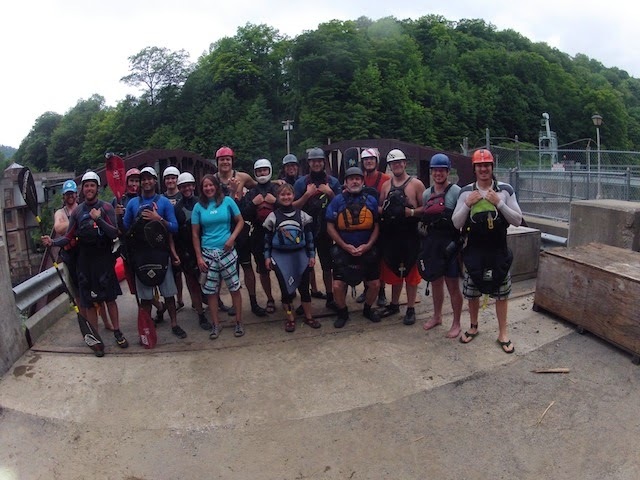 Maui Jim, KEEN, Accent Paddles, and Zoar Outdoor all donated to American Whitewater for the Silent Auction. Even I donated a free clinic with me which was won by Jim and we will be getting together soon to have a great day on the river. 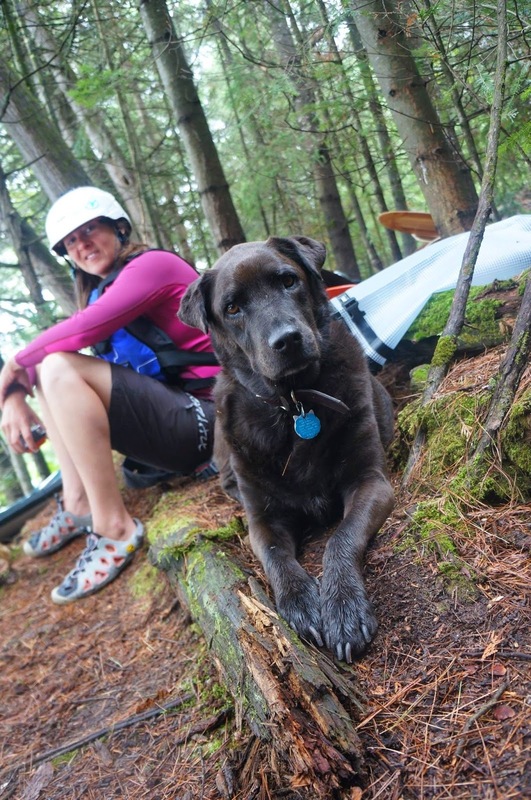 The Dryway Race series was on the same weekend which was a NECKRA and USACK point series event. The race had a great turn out with 19 racers. The mass start was entertaining as always with everyone starting backwards. Lorenzo from Chile came in first, followed by Tino and Jeff B. It’s a great race series and I wish more women came out to race. We are all just racing for fun nothing serious. There are no prizes, it’s all about getting out there and paddling as hard as you can for about 18 minutes and then laughing about what happened at the finish line. The next race is August 3rd at noon. 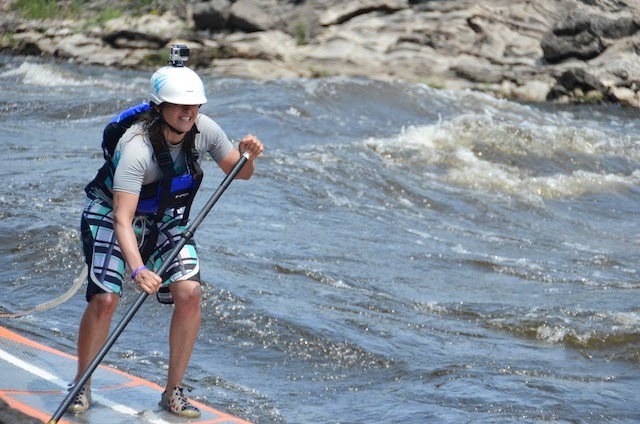 I headed up to the Ottawa River after that to compete in the Ultimate SUP Challenge. 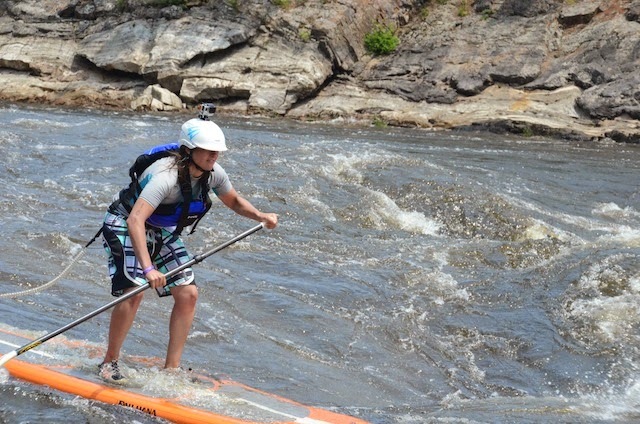 I’m not much of a SUP racer but I wanted to go to this event and give it a go. 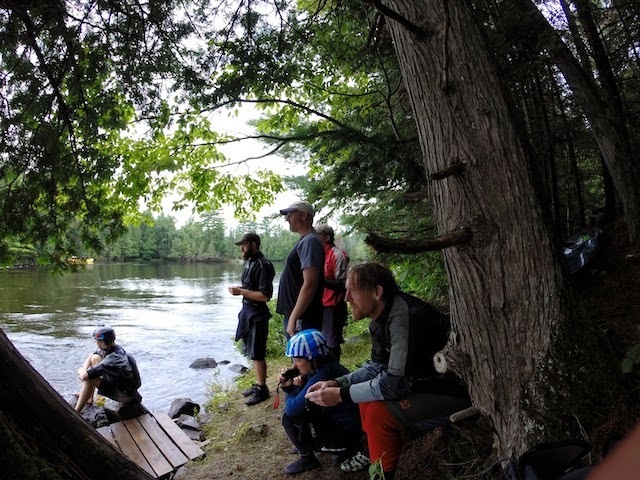 It was a whitewater and flatwater race combined. 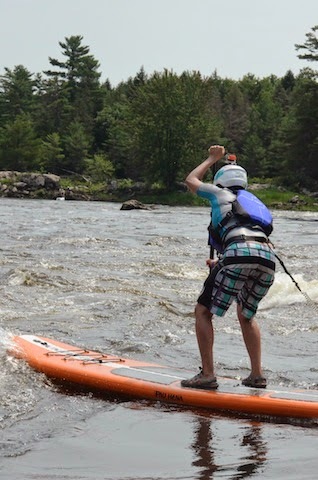 The whitewater race was held around Push Button. Prelims was the easiest course which was pretty much a quick peel out of an eddy and a sprint to the finish line. I took 2nd in prelims so I moved on to semis. Semis was a bit more of a challenge with some ferrying and a couple of buoys to go around plus the rafts were coming down endlessly. I got a do over run in semis when I was mauled by some rafts. I was able to finish second in semis thanks to the do over run. Jessica from the Toronto area took first in prelims and semis. We made it to finals as well as Kristin from California and Christian from the Buffalo area. Finals was a hard course you had to run down Waiki Ki which was a big wave train and then run a bunch of buoys. Only Mike Tavares and Todd Caranto made it without falling in. The tricky part was when you fell in, where was the current going to take you. I had the worst luck and was pushed toward the eddy line and then the river decided it wanted to eat me. I was sucked under and had about a 10 second mystery move. My leash which is made for whitewater breaks away with a certain amount of pressure and while I was getting down time it released so my board went downstream without me. 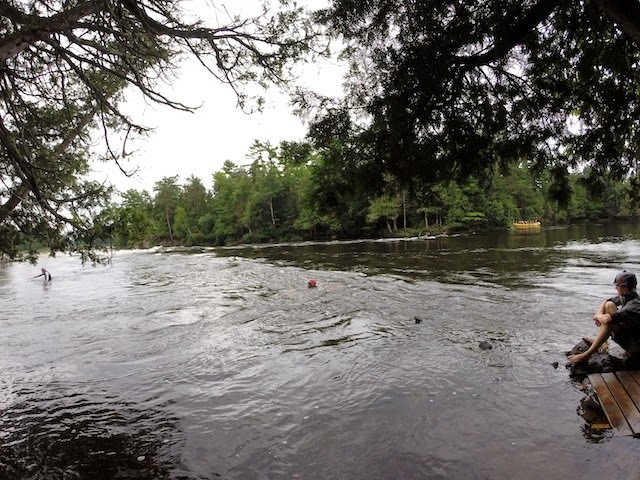 I resurfaced and swam to shore and unfortunately my race was over. Taking 4th in finals. Jessica also had some bad luck and was pushed into the same eddy I was, luckily she just didn’t get any down time. It’s a real hard eddy to get out of but she made it out and managed to get a second place finish in finals. Christian came in first place and Kristen came in 3rd. They both had great runs after swimming Waiki Ki and managed to stay farther left in the current avoiding the right eddy of darkness! It was a great day of racing! Sunday was the day I was dreading a 8km flatwater race. The first flatwater race I have ever done on a SUP. The race started and we had to run into the water and then hop on the boards. That was a fun way to start the race. The course was 4km that you had to do twice with some buoys to go around. I have no idea how to do a stern pivot on a board so the turns took me forever to make. I had to be real careful pacing myself during the race. The last thing I wanted to do was bonk and not finish because I tried to crush it at the start. I had moments when I was hating life but eventually fell into a groove. It also helped when I was finishing my first lap Dan Gavere who was the organizer and on the mic told me I should move closer to the bow like 10 inches and I’ll go faster. He was right and I went faster! The second lap was easier than the first and I came in third place in the women’s class. I was pretty happy with my finish. Jessica took first and Kristin second. Those are some fast girls! What a great event Dan and Harmony put on and the event also raised money for Lupus. I’m excited about next year and will work on a few things to be a better SUP racer. I came in 4th overall. Jessica came in first, Christian second and Kristin third for the overall results. A big thanks to Todd from Pau Hana Surf Supply for hooking me up with awesome boards! I spent the week at the Ottawa because the Jimi Cup was the next weekend. The level at the Ottawa wasn’t that great like 6.5 but Smoothy the squirt spot was still good and the river was really fun to run. The Mobius 49 is great in big water really stable and easy to maneuver. It was really easy to throw down river tricks like macho moves and wave wheels. It’s well balanced on it’s ends and that really made those types of tricks much easier to do in the rapids. Canadian Squirt Team Trials took place Saturday. A bunch of men tried out and only one woman, Shauna. Lot’s of mysteries took place and flatwater tricks in the eddy. I’m not exactly sure who made the men’s team but I think it was Lars, Ian and Mark but don’t hold me to it. It’s going to be a great ICF World Championships next year in Canada since it will be held at a great mystery spot. On Saturday night it’s the big nerf golf Jimi Cup Championship. We pretty much just take over paddlers meadow at River Run and pick random things as holes. Matt Hamilton and I were partners and clearly we need to practice for next year! Sunday was the Jimi Cup and man some of those guys and Claire can get some serious down time. I’m looking forward to improving my skills so I can work that sh*t next year. I didn’t get any mysteries during the event but that’s all good I’m still trying to just figure out how to keep my boat flat and spinning at the same time. I learned a lot about squirt boating while there and met a great group of people. I’m looking forward to next years Jimi Cup. This month has been pretty sweet and I’m so lucky to live the life I live with my loving husband Jeff, great family and friends. Getting ready for the first big wave. The timers for the Jimi Cup. Brook and I hanging out.